The Bare Hills serpentine area, officially recognized by the United States Geological Survey (USGS) as the Bare Hills Barrens (click here for USGS naming document), is of both historical and biological interest. The first chromite mine in the US was established here in the early 1800’s. Because of its unique soil composition, the area is host to a globally rare plant and animal community. This biological community depends on the open serpentine grassland that was maintained not by nature, but by humans for thousands of years. 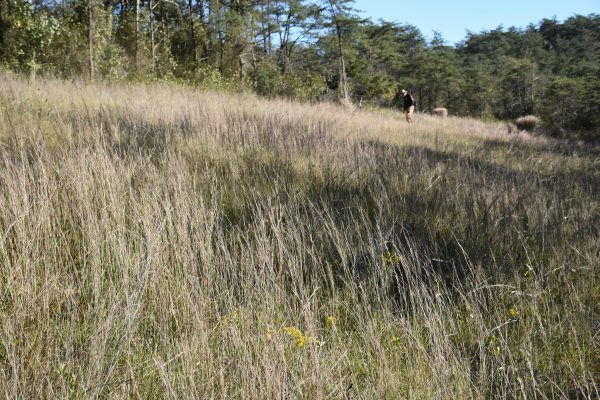 In 2012, the Lake Roland Nature Council and the Baltimore County Department of Recreation and Parks initiated activity to reverse the natural succession and began to reclaim the grassland. Working with Dr. Roger Latham, Ph.D. Ecologist/Conservation Biologist and a specialist in serpentine barren restoration, an area of about two acres that was still primarily grassland with scattered pines was identified. Nearly all of the distinctive species of serpentine barrens, including those that are rare, threatened or endangered, depend on grassland habitat. With habitat shrinkage comes population decline in local extirpation, especially of plants. Members of rare species in a shrinking habitat can be the “walking dead” — functionally extirpated even though a few individuals are still hanging on. The Bare Hills serpentine barren is one of a few undeveloped places in the United States where a unique metamorphic rock called serpentinite (or serpentine) occurs and can be found close to the Earth’s surface. Globally rare plant communities known as serpentine barrens have developed within this area of unusual rock and soils that lie within the boundaries of Lake Roland. The Bare Hills serpentine barren is a place of grasslands, pitch pine woodlands and scrub habitat which were historically dependent upon fire and grazing to remain open. The succession to woody vegetation (trees and shrubs) is the biggest threat facing these plant and animal communities. As the serpentine looked in the spring of 2013 prior to the start of restoration, photo below. Dry, generally open habitats are common traits of serpentine barrens. However, the close affiliation with serpentine bedrock makes the plant communities in this area unique, even among barrens. Serpentine rock contains numerous minerals, including nickel, magnesium and chromium, that were historically useful in the refractory and alloy production industries because of their stability at high temperatures. However, these minerals are toxic to many plants. The weathering of this rock produces thin, poor soils that — coupled with these minerals — creates a harsh environment for many common plant species. The unusual and rare plant species that have adapted to these conditions form the foundation for what makes these barrens globally rare ecological communities. An increasingly dense tree canopy restricts light that can lead to a decline in the populations of many of the barrens’ rarest plants that are adapted to more open settings. With the help of Dr. Roger Latham, Ph.D. Ecologist/Conservation Biologist and a specialist in serpentine barren restoration, a four phase Bare Hills Barrens Ecological Restoration and Maintenance Plan is being developed and put into practice under the management of Dr. Latham. Evaluate past and present ecosystems conditions. Assemble data to build a multidimensional framework for desired conditions determination. Draft ecological restoration and maintenance plan within framework. Carry out first iteration of the plan. In 2013, the Lake Roland Nature Council started clearing a 1.5 acre test plot of pines and low shrubs by cutting and forestry mowing. Due to the close proximity to residential communities the prescribe practice of “controlled burns” is not an effective clearing program for the Bare Hills serpentine barrens initially, but will be evaluated as the clearing area is enlarged and controlled burns can be properly managed. 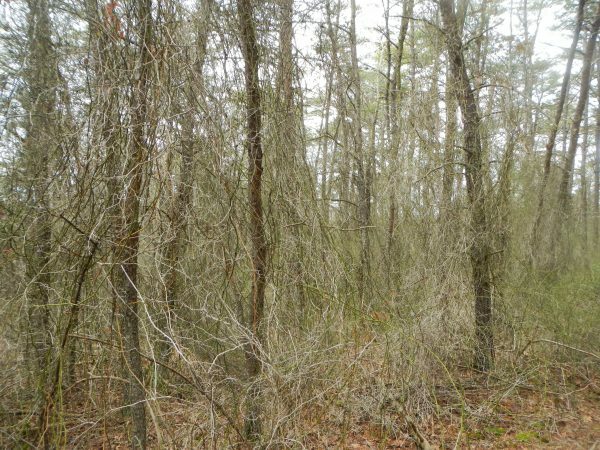 In the winter of 2014, the overall cleared area was expanded to about 3.5 acres by cutting and removing additional pines and pushing further into greenbrier thickets thereby further expanding the grassland. A service road for equipment access has been established, using serpentine stone quarried locally, in support of these restoration efforts. View photos of restoration here. The grasses and other plants associated with the serpentine area are now thriving in the currently restored area. Initially, the greenbrier in the open grassland remained a problem, however, multiple seasonal mowing efforts appear to have weakened the greenbrier significantly. Virginia Pine trees felled (and stumps) have been removed from the site to prevent additional biomass build-up. In addition, there have also been efforts to eradicate the invasive miscanthus that has spread through parts of the serpentine, primarily along Falls Road. Several tons of miscanthus have been cut and removed from the site. This project is a joint effort of the Lake Roland Nature Council, the Maryland Native Plant Society, the Guilford Garden Club, the Natural History Society of Maryland, Century Engineering, and a local paleoecologist, Bill Hilgartner, who has maintained a serpentine study plot in the park since 2000 (his study inventory and observations can be found HERE). 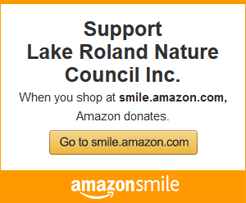 A group of dedicated Lake Roland volunteers are regularly monitoring and stewarding the barrens in order to keep these communities from becoming denser woodlands and forests. In the fall of 2017, serpentine grasses can be seen flourishing, photo below. With on-going fundraising and a dedicated volunteer workforce this restoration project is moving forward and will be expanding into Phase Two in 2019.